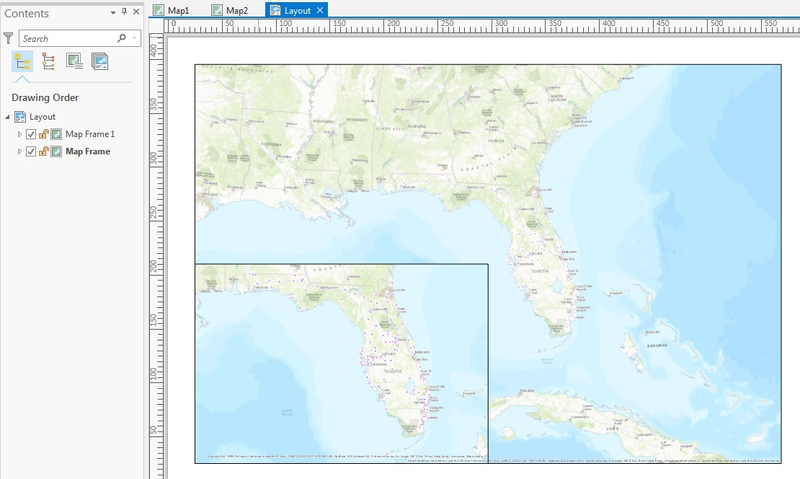 In a page layout in ArcGIS Pro, if two or more Map Frames reference the same Map, any manipulation to the layers in the Map (such as turning on and off any layer) affects both Map Frames because the Layout is referencing the same Map. This affects cartographic practices, where an inset map may be used to display the downtown area of a city and cannot display the data in the same way as the main map frame; the placement or existence of labels, symbols, and annotation differs completely. To avoid this problem, a separate Map must be referenced for each Map Frame in a Layout. 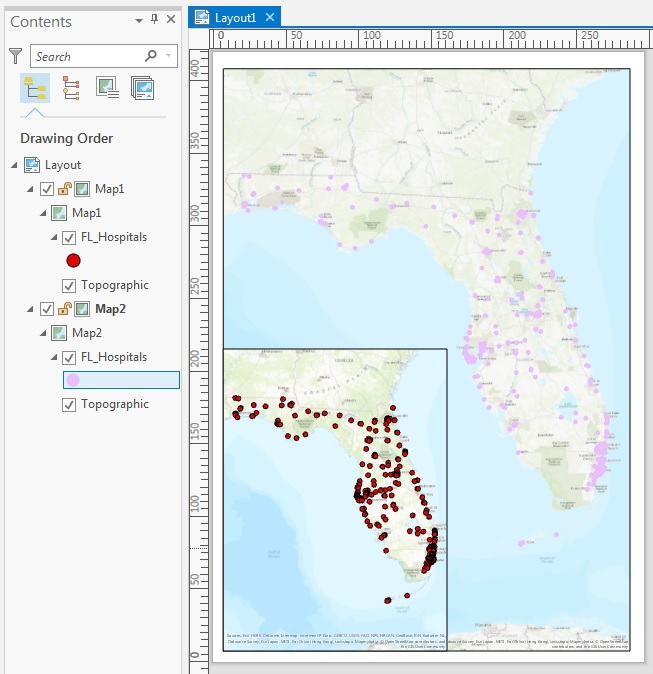 The instructions provided describe how to set up an inset map frame to reference the same data as another data frame, to allow for individual editing of the maps. 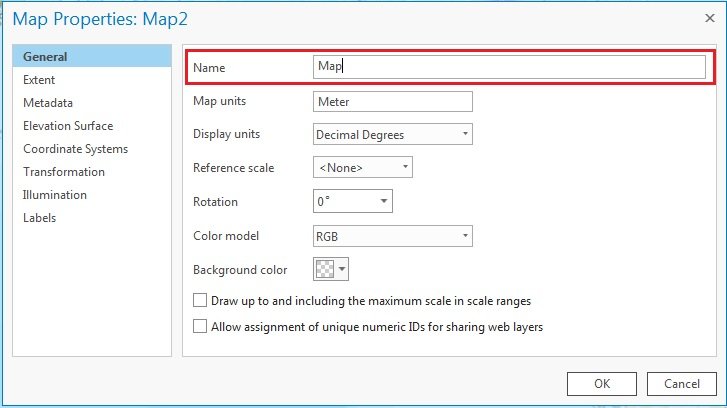 In ArcGIS Pro, open a project and navigate to the Insert tab, and click New Map > New Map. Repeat Step 1 to create a second map. Input the same data in both of the maps. To do this, navigate to the Map tab, and click Add Data. Select the preferred method of adding data. Repeat for the second map. Name the maps differently to distinguish between one another. To do this, double-click the map's name in the Contents pane, and rename the map in the Map Properties dialog box. Repeat for the second map. In the Insert tab, click the New Layout drop-down menu, and select the desired layout for the project. The Layout is added to the data frame. 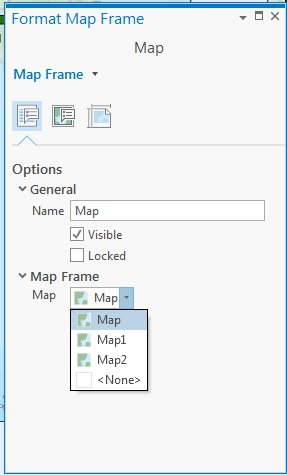 Insert two map frames by navigating to Insert > Map Frame, and select any of the templates for each of the maps. Right-click the first map frame, and select Properties. Ensure that the naming convention matches the name of the map, and the correct map frame is selected. Repeat this step for the second map frame. Right-click the desired map, and select Zoom To Selected. Zoom to the layer and make changes to the display settings, such as the layer's symbology on the desired frame. The changes do not take place on the second map frame, and the changes are kept within the map.